Immerse yourself in high-definition gaming, movies, and video experiences with a Smartphone 360 VR Headset! The way we play games and watch video is rapidly changing with the rise of virtual technology. And with the Smartphone 360 Virtual Reality Headset, you can take those experiences to exciting new heights! Designed to turn your iPhone, Samsung, or compatible smartphone into a complete 360 virtual world, our goggles help create digital adventures you never thought possible. Simply slide your phone into the front of the viewing, pull it over your head, and choose between thousands of games, videos, and 3D experiences that transport you to different planets and times in history. 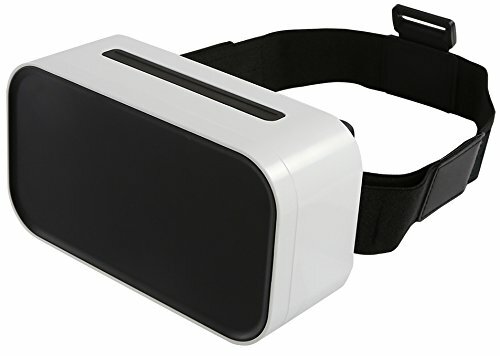 Complete with one-touch gaming controls and an audio jack to expand your listening and viewing experience, get the Smartphone 360 Virtual Reality Headset and turn your smartphone into the next generation of high-definition 3D gaming and movies! Experience the next generation of virtual reality gaming and video viewing with a premium Smartphone 360 VR headset by clicking 'Add to Cart' above. ✔️EXPANDED VR EXPERIENCE: These virtual reality goggles work with next generation iPhones and Samsung devices to bring HD viewing, gaming, and movies to life! ✔️WIDE VIEWING LENS: Enjoy a 360° view of virtual reality video games and 3D experiences with high-definition clarity that draws you into to the digital world. ✔️LIGHTWEIGHT, ADJUSTABLE FIT: These immersive VR virtual reality headsets provide better comfort across the nose, neck and eyeline along with soft, breathable eye pads. ✔️ADVENTUROUS TECHNOLOGY: Working flawlessly with today's top smartphones with screen size 4.7"-5.9", our VR glasses can be enjoyed at home, while traveling, in the car, and even outdoors. ✔️GREAT PERIPHERAL SUPPORT: The Smartphone 360° can also be used while charging your mobile device and features an audio jack to enhance game or video enjoyment. Includes FREE VR App Games. Note: Best used without eye glasse.